Been diving in Crocodile Avenue? Please Vote! 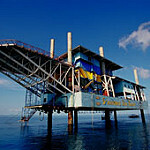 Like many of the dive sites on Mabul Island, this fantastic muck diving site has a lot of marine life for macro divers. Macro photographers will also have a great dive and come away with some fantastic of some unusual smaller marine life. The dive site gets its name from the many crocodile fish found on the sandy bottom. The dive site varies in depth from around 5 metres to about 20 metres. Visibility is around 10 metres and so divers will need to look closely amongst the corals to spot the marine life. There will be many snake eels and occasionally divers can spot ghost pipefish. Exploring the area carefully will reveal many seahorses that can be found on amongst the seaweed or on the sandy bottom. There are many other species found here such as parrotfish, mackerel, barracuda, and even turtles. The real reason to visit this site though is to spot the crocodile fish. These unique fish are found mainly on sandy bottoms. They are capable of changing colour, as their surroundings change. This camouflage hides them on the ocean floor and assists them with their hunt. They are well known predators that remain hidden from their prey, launching sudden surprise attacks. Their head and eye resemble a crocodile, which gives them their name. Night dives are excellent on this site as the cuttlefish, sepias and Spanish Dancers all emerge. Many crabs are also commonly seen on night dives including the small boxer crab. Map of Mabul, Crocodile Avenue dive site.